How to Transfer Photos from PC to iPhone XS Max/XS/XR/X/8/7/6 etc? There are several options available for you to transfer photos from PC to iPhone, including Dropbox, iCloud, iTunes and third-party iPhone photo manager. Each has its strong points in the photo transfer from PC to iPhone process, but here we would like to offer you 2 ways to transfer photos from computer to PC – with iTunes or via third-party iPhoto manager for the sake of your user experience. If you want to know why we don't adopt the other ways, you can find the answer in the following explanations. 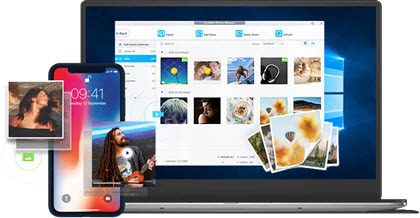 With the same operating principle for photo transfer from PC to iPhone, DearMob iPhone Manager would be the best iTunes alternative that abandons all the unfriendly points of iTunes, and offers you the easiest guide to transfer HEIC/PNG/JPG/Live photos, images, pictures on iPhone XS Max/XS/XR/X/8/7/6 etc and PC back and forth. 100% free, no data lose and no restriction to file formats. Dropbox is Windows' AirDrop but more similar to iCloud. It is more likely to be a method to backup iPhone photos with photo transferring function, but you need to download and install this app on both your iPhone and Windows PC first, open the app on PC to upload photos and then use the app on iPhone to download photos to realize photo transfer from PC to iPhone. iCloud is also complicated in transferring process just as Dropbox. Worse still, iCloud is free only when you transfer photos from PC to iPhone in 5GB. If your Photo Library is larger than 5GB, iCloud Photo Library will not upload photos for transfer unless you pay for extra storage. Both the two ways are quite common but requires network. If you are not that lucky to have WiFi to transfer photos from computer to iPhone, you are suggested to try the traditional one – use iTunes. iTunes would be the traditional method that people especially Apple fans frequently use to transfer photos from computer to iPhone or vice versa. However, we can't help telling you the disappointments of iTunes for the sake of your photo transferring experience. For instance, when you sync photos from computer to iPhone, all the existing music, movies, TV shows, books, and tones on your iPhone may be incatiously removed. That's why we list another way – DearMob iPhone Manager which is more pleasing to transfer photos from Windows  PC to iPhone XS Max/XS/XR/X/8/7/6 and other idevices. How to Transfer Photos from Computer to iPhone without iTunes? Unlike other third-party iPhone photo managers, DearMob iPhone Manager can automatically detect iPhone without the installation of iTunes to transfer HEIC, JPG, PNG, Live photos between iPhone XS/XR/8/7/6 etc and computer. It is a single-minded and professional iPhone photo manager focusing on transferring, managing, organizing photos between iPhone and computer in a click. Camera Roll photos, Photo Stream, Photo Library photos, downloaded pictures and synced images? This tool digests them all. Click the download button here to free download DearMob iPhone Manager Windows (10) set-up, double-click the .exe set-up and follow the guide to install the application. When you launch DearMob iPhone Manager, you are asked to plugin in your iPhone to your computer with USB cable. Once connected, you need to tap "Trust" on your iPhone to continue. Step 3. Transfer Photos from Computer to iPhone. 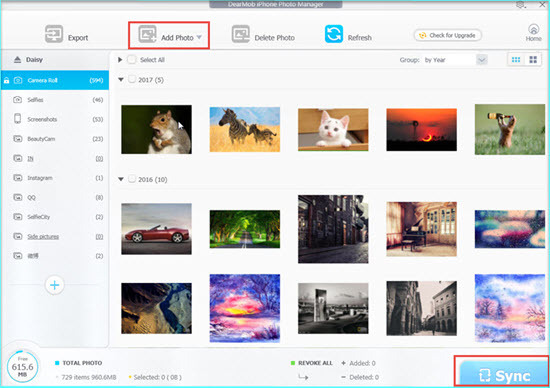 When the connection of your iPhone and PC is done, you will access to the photo transfer interface where you can see various icons. Click "Add Photo" icon and choose the photos you want to transfer from the popping-up window, then click "Sync" button for successful transferring. Notice: DearMob iPhone Manager now supports HEIC that you can backup HEIC photos to computer in a click. How to Transfer Photos from PC to iPhone with iTunes? Step 1. Connect your iPhone to PC with Apple original USB cable (The original one will prevent sudden disconnection. ), and then run iTunes. Step 2. Create a folder to contain photos you want to transfer on you PC. Step 3. Click Device -> select Photos -> check Sync Photos -> choose the folder you just created -> click Apply to start to transfer photos from computer to iPhone. Notice: When you use iTunes to transfer photos from PC to iPhone/iPad, you have to click the "Remove and Sync" to contiune like the picture shows. Once you do that, you will lose all the data synced to your iPhone, like music, movies, TV shows, books, and tones. If you need these files, you'd better choose method one to transfer photos without data losing. Obviously, iTunes is much more complicated than DearMob iPhone Manager to transfer photos from computer to iPhone. Besides the complex operation and data erasing shortcoming, iTunes also comes with time-consuming sync, limited supported formats, not detecting iPhone, etc problems. So, DearMob iPhone Manager is suggested here when you just want to have an easy and quick operation to transfer photos between iPhone XS Max/XS/XR/X/8/7/6 etc and computer. This tool is also compatible with iPad and allows you to delete unwanted iPhone pictures in batch. How to Copy Pictures from iPhone (8/7) to PC without iTunes?